We are all piled in Mac’s truck…family and friend, and we’re headed to my parents house for the last load…the last pile, the last box. Moving men are just ahead of us, prepared to sweat and lift and move and push and shove (Thank GAWD) while we pick up, pull up, pack away and prepare to move everything that’s left OUT. Then the For Sale sign will go up and that house will be a memory. It holds no special memories for me because I never lived there….my childhood home was in many places, moving as often as we did. But all my parents stuff was in this house and it won’t all fit in the new, smaller place next door to me, so lots of it will go in storage until a time comes to go through it all and sort and decide what to keep and what to toss. Mama wants to keep everything, so we will…..I see I come by that honestly….and there are patterns, jewelry, photos, notes and strings of yarn, all knitted together with 87 years of life. Some of those things hold special memories for my parents, some just a reflection of an earlier time, a tiny nugget of a different place, a different life. I’ll never know all the memories, or what the small things mean and I hate I missed out on that story. In the corner of the living room, under a box of pictures and receipts, covered in dust and memories is my old piano stool. When I was 5 or 6, Daddy bought me an old, upright, used piano for $50 and I’m betting it was part of a payment for carpenter work he did for many of our friends and friends of friends. I was in Heaven and couldn’t WAIT to start taking lessons. But I HATED that piano stool…I wanted one like the piano teacher had ~ the long, sleek bench seat that you could raise the lid and stash sheet music and lesson books inside ~ that was the seat I knew was the best one for playing the piano. I had NO use for that rickety, small, uncomfortable OLD stool. As time went by, the stool went along with us everywhere we moved. The last I remember it being used was as an extra seat when company came to dinner ~ a rare occasion. I began to see the beauty in that old stool ~ the glass balls for feet, the well-worn, smooth wood on the seat, the hand carved legs. I have no idea where it came from but that’s on my list of stories to hear ~ very soon. 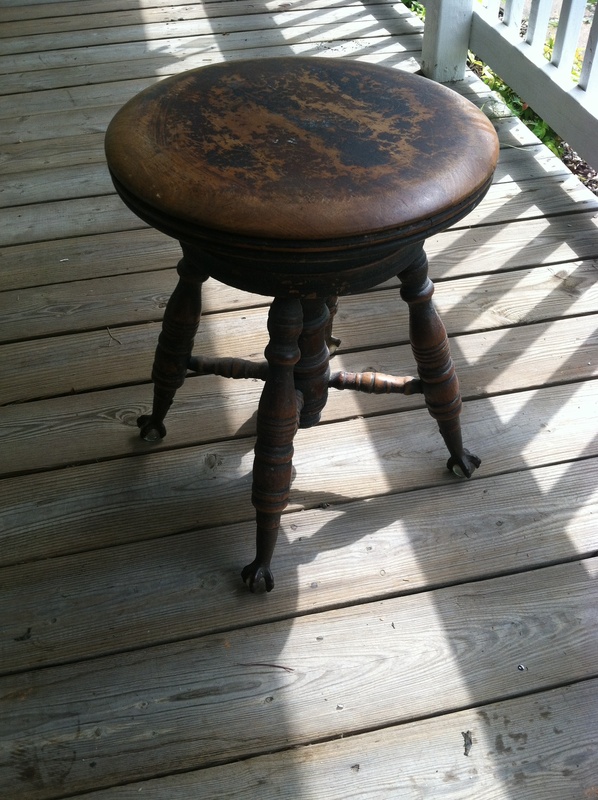 Today, the stool sits in my living room ~ waiting for Tater to spin ’round and ’round on it, and maybe sliding it under her own piano one day, taking lessons….and wishing she had a long, sleek bench of her own…. At 51, I think I have YEARS to go before I have to do this….but I should be more careful, more sharing, more aware and tell my family the stories I want told. They might not listen, but I hope they hear what I’m saying and remember it when I turn 87 and am packing all my treasures in a box. I’m gonna go ahead and make up some labels that say, “Glitter” because I feel pretty sure I’ll have LOTS of it by then. My Mom died when she was 96, and when my sister and I went thru the house, we thought it would be a breeze because there wasn’t any clutter out. Well her drawers, 2 dressers full and stuff crammed in them that so surprising to us. We found things that we gave her for Christmas past (that she asked for), a ton of doilies that she knitted, a bunch of rolled up rubber bands?, etc. We were flabbergasted, but it was nice to remember those things together. I did get an antique chair that was my Grandpa’s, He only sat on it when his “westerns” were on or for Ed Sullivan. It’s in my living room now. My favorite thing. Thanks for the memories. What a fabulous memory! Excellent storyI love reading your post! Oh yes wasn’t there one of those in almost every house. We did not always wanted one and wanted the piano to go with it. Seems it wasn’t a priority for our budget, imagine I survived and it did not mar my life. Seeing that stool brought the memories of the aunts and cousins who did have them, if I find one at an antique store I’m gonna buy one and name it my Sasha stool. With love !!!! Thanks for the memories. Katrina ~ I have the dresser…not my mom’s but one Mac got me years ago at an antique store. And that stool would look PERFECT with it 🙂 And what a great gift to have the history of your father in law ~ sing on…. I agree wholeheartedly with Trish – all too soon the ‘stories’ will be gone forever. When my sweet momma turned 71 years old we bought her a cassette recorder and about 10 blank tapes. When we visited we’d ask her questions, or ask her to share a story with us and we’d record every word. She passed away a few months shy of 73. I treasure those tapes. For this past Christmas my oldest daughter (just turned 33 last Thursday) gave me a priceless gift. She’d come across a cassette tape that Grandma Whited (my momma) had recorded for her on her 10th birthday. It was full of gospel songs my mom & her sisters would sing at church, was well as some fun songs she’d sing with the children she babysat each day (my girls, two of the neighbor girls, occasionally some of her other g’littles)…she even recorded the “Happy Birthday Song” as she sang it to my daughter. Andi burned it to a CD and presented it as part of my Christmas gift this year. I can’t begin to tell you the tears I cried even as I was smiling at being able to hear Momma’s voice singing again. She couldn’t have bought me a better gift if she’d had all the money in the world! Yes – all too soon the time comes when we discover it’s truly the little things we cherish the most. Love & hugs to you, your momma, Tater & Mac! Loved your story.. Be thankful for EVERY single day you have to remember… my Mom is gone and my Dad has Alzheimers.. I too have no one to give me information and share memories with..